A lot has changed for Canadian Prime Minister Justin Trudeau since he swept to power almost four years ago. What hurdles does he face as he heads into another election year? Shortly after he was elected, Justin Trudeau grabbed international headlines for a breezy quip explaining his gender-balanced cabinet: "Because it's 2015". The come-from-behind ascent of the young leader marked a new era of progressive Liberal politics in Canada after voters ousted a Conservative government that had been in power for nearly a decade. His government has kept some promises since: it overhauled the child benefits scheme, legalised recreational cannabis, and gave parents the option of taking an extended parental leave. But there were fumbles along the way: a disastrous overseas trip to India, broken promises on electoral reform and on short-term deficits. Now, heading into his fourth year in office, his government is sounding a little less breezy and looking a little more battle-scarred. It's not surprising to see a politician nearing the end of his or her mandate hit "a patch of malaise or quicksand with the electorate," says Shachi Kurl, executive director of the Angus Reid Institute, a not-for-profit national polling firm. "We all remember what felt like the never-ending honeymoon, but his approval has been deteriorating over time." 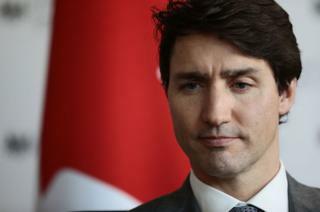 With a federal election scheduled for next October and analysts warning of possible trouble ahead, what are the challenges facing Trudeau as he seeks a second mandate? The economy is motoring along nicely. Unemployment is at its lowest in decades, and inflation is on target at just over 2%. Canada also managed to clinch an updated - though still to be ratified- free trade deal with the US and Mexico after months of uncertainty that spooked businesses dependent on the North American partnership. But not everyone is feeling confident about the future. In fact, pollster Darrell Bricker says Canadians are uneasy about things taking a turn for the worst. "People are feeling like they're left behind, they feel like they're not connected, they're feeling overwhelmed, and they're concerned that their economic position seems to be declining from generation to generation" says the CEO of Ipsos Public Affairs. "It's something that's really emerged over the space of the last three years. It's the affordability issue." There are warnings of a possible economic downturn and more market volatility. Interest rates have been exceptionally low for a decade in Canada, leading many households to a build up debt, mainly from mortgages, and major cities like Toronto and Vancouver have seen house prices skyrocket. Bricker notes interest rates are expected to continue their slow rise this year, meaning indebted households now just getting by could face more financial hardship. For Trudeau, who campaigned on the promise to help "the middle class and those working hard to join it", that could spell trouble. Angus Reid's Kurl says that continued budget deficits - the finance department says government books could be in the red until 2040 - have also been worrying some Liberal supporters enough they are now drifting towards the Conservatives or into the "undecided voter" camp. Still, the prime minister's political opponents - right-leaning Conservative party leader Andrew Scheer and left-leaning New Democrat Party leader Jagmeet Singh - have so far failed to capture the public's imagination. Bricker says the question is whether they can "get on people's radar" between now and next October. Oil and the environment have been giving the Trudeau government headaches for months. Trudeau's new national carbon pricing plan - a signature policy in the effort to meet greenhouse gas emissions targets - is facing opposition from a number of provincial governments affected by the plan. Two are going to court over the scheme. How do you stop green taxes hurting the poor? It's also a deeply divisive issue among the electorate, which hasn't escaped the notice of Trudeau's political foes. Trudeau promised the carbon tax revenues would be returned to many households through various rebates, but people are worried about an increase in petrol and heating bills. On New Year's Day, when the price on carbon came into force, Scheer held a news conference warning that its "single achievement will be making everyday essentials more expensive for all Canadians". Trudeau's green credentials have also been roiled by his government's efforts to get a major pipeline expansion built. Environmental groups are angry at the Liberal government's support of Trans Mountain, a pipeline expansion project they see as entrenching Canada's reliance on oil. Analysts say new pipelines are necessary to deliver the country's landlocked oil to the coast because it would allow companies to sell the commodity for higher prices overseas. Despite the Trudeau government's support, the Trans Mountain expansion is currently under review following a court ruling that quashed federal approval of the project. Canadians from the oil-rich province of Alberta are angry. The province recently ordered cuts to crude oil production to help tackle tanking oil prices. Frustrated oil workers and supporters have staged a number of protests in recent weeks. Alberta has never been a stronghold of Liberal votes, but Kurl says Trudeau's failure to get a major infrastructure project built has lead to the question: "Is this someone who is actually in control of the country?" "It starts to worry the business community, it starts to worry Bay Street investors" if the federal government is unable to build the projects they back, she says. Migration and immigration aren't the top concern for most Canadians - issues like health-care and the economy hold that spot. But that doesn't mean Canadians aren't worried about their southern border. In the past two years, over 38,500 migrants have crossed the border illegally in order to turn themselves over to authorities and make refugee claims. The sheer number of asylum seekers has strained the resources of government and community organisations. The wait-time for hearings by Canada's refugee board has edged up to an average of around 20 months. The federal government is somewhat limited in what they can do to prevent the phenomenon, though they have launched media campaigns among targeted communities warning that asylum is not guaranteed. But with a report projecting that supporting and processing the asylum seekers could cost taxpayers over C$1bn, there is a growing sense the file has been mishandled. Immigration Minister Ahmed Hussen is one of the least popular ministers in Trudeau's cabinet, according to the Angus Reid Institute. Two provinces, Quebec and Ontario, are asking the federal government for a combined C$500m to cover the costs of accommodating the asylum seekers. The Liberals have a weakness here, says Kurl, with voters from all parties identifying it as a poor issue for Trudeau. Kurl calls it a "lurking vulnerability" given the subject tends to bubble up into public consciousness in late summer when migrant numbers have jumped in the past - and this year just in time for the next election campaign.